In what is likely the end of MTV’s Urge music service, Viacom’s MTV Networks and Real Networks have shaken hands on a deal to launch a music store joint venture to compete against iTunes. The Urge music service will merge with Real Networks Rhapsody service to form Rhapsody America. Music from the combined entity will be available via the net as well as through an integrated service with Verizon’s VCast cell phone service. Financial details and other terms weren’t immediately disclosed but review of the 8-K filing with the SEC shed a detailed light on the joint venture. The new venture will be headed by Michael Bloom, the former general manager of Urge. The Urge channel, which was built along with Microsoft on the Windows Media Platform, won’t die immediately. Discussions with Microsoft about their partnership are ongoing. For now, Urge users won’t be forced to migrate immediately to Rhapsody America, though a timeline wasn’t disclosed. Real Networks CEO Rob Glaser noted their big ambitions in a conference call for press and analysts saying: "The pieces are such that we think one plus one, plus one equals big — certainly more than three." He also said the announcements "represent a sea-change in the digital music market." The new company, Rhapsody America LLC, will be run by a committee of 4. Real Networks and MTVN will each appoint two people. The company will have offices in New York, Seattle and San Francisco. MTV Networks is contributing cash in the form of a 5year Note for $230m. It is also pledging their URGE subscribers and licensing the URGE brand. 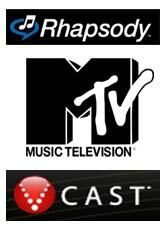 Real Networks will roll some licensing contracts (for the music library etc) into the new venture. They will also contribute hardware, staff, their Rhapsody subscriber list, the Rhapsody.com URL and other content. Some of the material will be licensed, other’s contributed outright. Real Networks will own 51% of the new company, MTVN 49%. Effective immediately, URGE customers can use their username and password to access the Rhapsody site. Pricing models, both subscription and per/song have not yet been detailed. The company will begin testing universally playable DRM-Free music from Vivendi’s Universal Music shortly (Universal announced about two weeks ago that they would test DRM-Free music but be bypassing iTunes in the offering). The new venture will likely be promoted heavily at MTV’s video music awards in September. Will it be an iTunes killer? Probably not but with the marketing weapons at its disposal and the increasingly available pool of truly portable drm-free music, it stands a chance of being succesful (though pricing models will likely be a big factor).